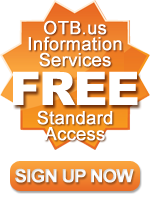 OTB is growing in popularity throughout the United States. 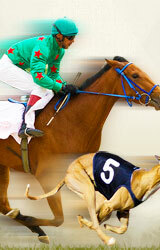 OTB facilities offer an alternative to wagering at racetracks. And like betting done at tracks, states receive a portion of the pari-mutuel handle, or take. The advent of the internet has given a whole new meaning to OTB. Many observers say that Off Track Betting is fast becoming Online Track Betting. Online race books like RaceBook.com, brings betting on your favorite thoroughbred, harness, greyhound racing and jai alai events in the comforts of home. 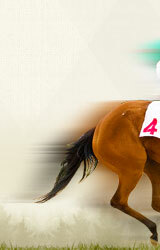 Horse racing continues to be one of the popular spectator sports in America. But in its early beginnings, horse racing was a sport that was enjoyed and wagered on mostly by the upper class. After the Civil War, horse racing tracks opened throughout the east coast paving the way for bettors from all economic sectors to enjoy the thrill of the past paced action. In the Early days of horse racing, many enterprising bookmakers started 'auction pools' which involved auctioning off bets for each horse in a race. But this format was short lived because bettors were out of luck if the horse that they wanted to wager on was already taken. The bookies, known for being innovative, soon realized that setting odds on individual horses would increase betting handle and, in turn, the bookie's hold. When there was overwhelming money on one horse, the bookmaker would simply lower the odds to increase the attractiveness of other horses in the race. This format is still in use today. By the 1920s there were more than 300 racetracks in the US in addition to thousands of 'pool halls,' or off-track betting facilities, which were connected to the tracks by telegraph wires. Here locals could place their bets on horses at a multitude of racing venues around the country. Illinois was the first state to permit race tracks to own and operate OTB facilities. Balmoral opened Illinois' first OTB parlor, located at Peoria, on September 8, 1987. Parimutuel betting (French for mutual betting) is a betting system in which all bets of a particular type are placed together in a pool; taxes and a house take are removed, and payoff odds are calculated by sharing the pool among all placed bets. The parimutuel system was invented by Parisian perfume maker Pierre Oller in 1865 when asked by a bookmaker friend to devise a fair system for bettors which guarantees a fixed profit for the bookmaker. The large amount of calculation involved in this system led to the invention of a specialized mechanical calculating machine known as a totalisator, "automatic totalisator" or "tote board". The first was installed at Ellerslie Racecouse in Auckland, New Zealand on 1913. Since then totalisators came into widespread use at race courses throughout the world. The first totalisator in the US as installed at Arlington Park, near Chicago, Illinois in 1933. The parimutuel system is used in gambling on horse racing, greyhound racing, jai alai, and all sporting events of relatively short duration in which participants finish in a ranked order. A modified parimutuel system is also used in some lottery games such as Lotto South. Parimutuel gambling is frequently state-regulated, and offered in many places where gambling is otherwise illegal. Parimutuel gambling is often also offered at OTB facilities, where players may bet on the events without actually being present to observe them in person. Parimutuel betting differs from fixed odds betting in that the final payout is not determined until the pool is closed - in fixed odds betting, the payout is agreed at the time the bet is sold.